Did you know that our Honey Habanero Hot Sauce makes an awesome glaze? If you aren’t into chicken, it work very well on all the sea and land faring creatures as well as on Tofu. We do recommend that you add it last while grilling because it is made using local Wilmington honey and will burn if added too early on. Liberally brush it on the last 5 minutes of cooking or use as a side dipping sauce! 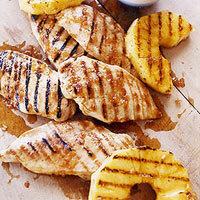 Some freshly grilled pineapple, brushed with our Local, Horomone and Antibiotic Free chicken is a must try.